Your pet may be a member of your family, but sometimes it’s easy for them to invite an unwelcomed guest to take up residence in your carpets, couches, and corners, unintentionally causing a big household problem. We will ask where you have experienced fleas or ticks to determine the extent of your infestation. We use their “science-based approach as they conduct a visual inspection of the likely areas of infestation, including areas where your pets have been. Ashcraft Termite and Pest will outline suggestions for implementing an integrated pest management solution specific for your home. We will discuss which areas of your home may require preparation before treatment. Thoroughly Vacuum First, thoroughly vacuum the entire house, including hard surfaces, with particular attention to any place an animal rested or where animal bedding is situated. Be sure to get under everything – furniture, rugs, etc. You may also need to vacuum and treat furniture. Once you are finished, immediately seal your vacuum bag in a plastic bag and throw it away. This prevents the fleas from crawling back out and infesting your home again. Vacuuming and shampooing or steam cleaning the carpet can kill some of the larvae; however it may also still leave some live fleas, so a chemical treatment may be necessary. Hot Wash All Linens Wash all linens and pet beds in order to kill possible fleas. You should wash and dry any bedding at the hottest temperature it will tolerate or, if washing is not feasible, discard it in an outside trash receptacle. Keep Your Pet Away To ensure the safety of you and your animals, it is recommended your veterinarian treat your pet for fleas and/or ticks on the day Ashcraft Termite and Pest provides service. This should prevent your pet from re-introducing the pest into the treated environment, as well as remove the insect for the benefit of the animal’s health. Make sure to remove any pet feeding dishes or any other pet-related items from the treatment area. Please keep your pet out of treated areas until materials are dry (approximately one hour) and ventilate the interior during that time. Pets moving indoors to outdoors (and vice versa) make it virtually impossible to treat ticks and fleas without treating both the exterior and interior of your home. Begin by thoroughly cleaning your yard. Remove yard and garden debris including stacked wood, piles of bricks, and discarded pots that are the ideal breeding ground for fleas. The more clutter, the more places fleas can take refuge. Sweep off patios and lawn furniture. Don’t forget to check out your pet’s favorite places to hang out including dog runs or kennels, spaces under decks or porches, beneath low-hanging shrubs, or along fence lines. 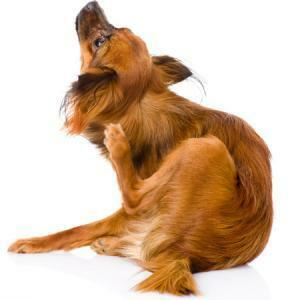 Flea and tick larvae can remain within 50 feet of any cool, shady spots your pet favors.